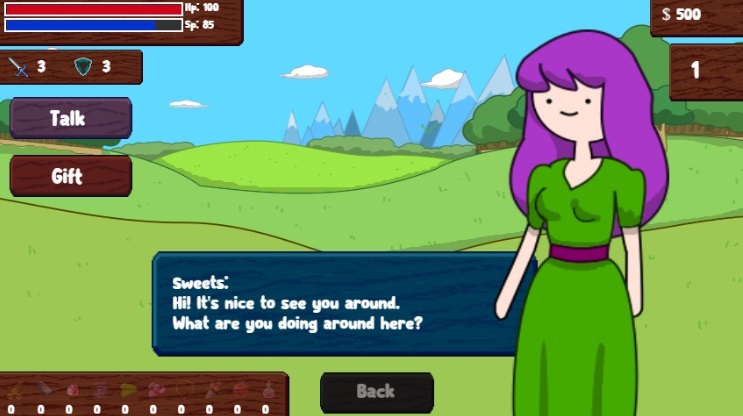 This game was made for 2019 TvGameJam and is based on Adventure Time by Pendleton Ward and produced by Cartoon Network. Are you looking for feedback/bug reports? Or was this solely for the jam? This was made solely for the jam but oof course i want feedback, About the bugs as far as i know the shop bug it's solved but i didn't uploaded the corrected version. If you found some other bugs please let me know. I don't know if i will keep on working on the game, but i will consider all feedback and bug reports to avoid them in the future. Thank you for playing, and for your comments. I think you did a great job on this! The art style really fit and I like that you took the time to add so many elements including trade and enemy attacks. It's a lot to stuff in there and while there were a few hiccups, like the fact that I could keep selling items even if I didn't have any more of them to get infinite money, it was a real feat for a jam submission. Very good job and good luck on any games you make in the future! Thank you for your comments and time you took playing this, i wanted to add a ton of features and some of them went right to the trash bin because there was no time to program them. The shop bug was fixed right after the game was uploaded, but i decided to keep it there to let players finish the game without limitations and test all other features. The art and music are real nice. I think this did a very nice job of fitting the game's presentation to the source material! Thank you, it's a very primitive game, but i wanted to keep the adventure time atmosphere.